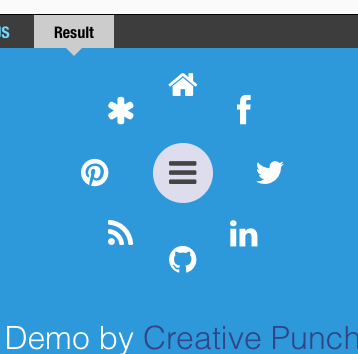 Have a look at the demo below and click the button for the radial menu to pop out. The code is readily available in the codepen demo above, so let’s go over some of the specifics. Let’s look at the HTML. We will be using the HTML5 nav element with some links inside of it and the button to activate the radial menu. I have also used Font Awesome icons and added the necessary classes to the a-tag to get some nice icons for the menu items in the radial menu. So let’s look at some of the CSS here. First we define a width and height for our radial menu’s root container (in this case the nav element with the circular-menu class. We also define the position property as relative so that we can position other items relatively. By default the menu items will be hidden. We want a nice fade + zoom effect so we will start the menu items out at 0 opacity and also set the scale to 0 with the transform property. You can also see that we have defined the animation with the transition property. To make the menu items zoom and fade in, we want to toggle it between classes. So let’s define an open class for the radial menu. So, once the open class is put on the same element as the circle class, it will apply the new properties according to the animation length and type defined by the transition property. And of course we need to position and style our menu toggle button. Now let’s move on to the final part, the part which makes our menu a real radial menu! First, let’s make our menu toggle button show and hide our menu items. This will select the element with menu-button for class and listen for a click event. Once you click it it will take the element with the circle class and add the open class to it. Now the last thing on the list is the positioning. What this code does is select all the links within the element with the circle class. You can then loop through these items. We then use the iterator (i) to calculate the CSS top and left property with some basic geometry, using the sine and the cosine. I hope this will help you make a cool radial menu. If you made something awesome, feel free to share it in the comments! If you liked this tutorial be sure to like it and share it on your favorite social media! Hello. It works and I like it. How can I put my own icons? Please! I get this jslint problem move ‘var’ declarations to the top of the function. something to do with this line. I am new to js. For those having trouble with getting it working in IE11, I added “position: relative;” (without the quotation marks) to the css for .circle and it worked for me. Hi, could you explain where the numbers 50 and 35 are coming from in your JS positioning code? I’m using my own buttons which have a slightly different CSS style than yours. I tried using your JS code exactly but my buttons aren’t positioning correctly – perhaps the positioning is being calculated using the specific width and height of your buttons, or another property not reflected in the above CSS? Thanks! Works in IE11 and IE10. Something about document.querySelectorI() throws it in IE9 (didn’t try to go further). Site I work for – we support down to IE 8 at the moment, so I can’t use it without a fallback. it works well… good pen. Hi, I have tried above example but its not working for me. could you please give me the example for download .